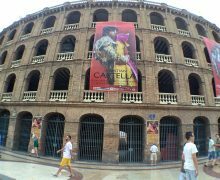 Apply now to reserve your place in Valencia, Spain. GENERAL LOCATION: Seaside city on east coast of Spain. Easy access to Barcelona and Madrid. FOCUS: Modules in public relations, sports journalism, feature and travel writing, multimedia and design, photography and video storytelling -- or a separate program on public relations campaigns. Led by a team of award-winning journalists and professors with international experience, students will explore the ancient neighborhoods and bohemian hideaways of Valencia to flesh out stories about a city that brims with historic tradition and dazzling nightlife. 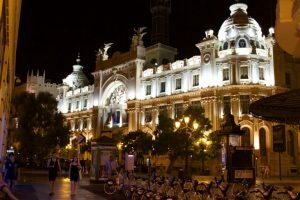 Considered by Lonely Planet “a vibrant, friendly, mildly chaotic place,” Valencia is a perfect spot for energetic reporters seeking adventure, and it’s an extraordinary foreign experience. The emphasis of study is on innovative storytelling across platforms. Students will learn and practice mobile and social media journalism, sports writing, feature writing, broadcast journalism, photo/video journalism and design. Students will receive an hour of Spanish instruction per day. 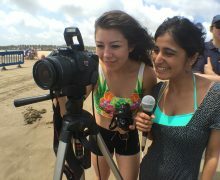 Journalism instructors will review interviewing techniques and intercultural communications skills. The staff will help students develop stories that will boost their portfolio and credibility as correspondents, to help in job placement. Examples of student work are available at thisisvalencia on medium.com and thisisvalencia.wordpress.com. 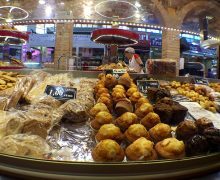 There is much to discover and report about in the neighborhoods, beaches and cultural sites of Valencia. The beaches are only 15 minutes away from the center of town. Valencia has great public transportation, with a subway, tram and bus service that connects the whole city. Among the cultural attractions, Valencia boasts an Oceanografico marine complex; Bioparc Valencia, an immersion zoo that replicates the habitat of Africa; and a City of Arts and Sciences that has six state-of-the-art buildings dedicated to culture and the performing arts and a world-class museum. The La Lonja de la Seda (silk exchange) is a UNESCO World Heritage Site. With guidance from the instructor, students will develop a campaign for a local client: business, NGO or a branch of an international organization. The emphasis of the program is on the practical application of the students’ skills in a challenging environment. While this course is the most relevant to upper-level PR or integrated communications majors, students from all backgrounds will find it useful and interesting. Gain a clear understanding of campaign planning. You will build on all the critical thinking, research, content creation and strategic planning skills that you developed in previous classes. Get the feel of the communications industry abroad. You will meet with local industry professionals and travel to Barcelona to visit some of Europe's leading communications firms. City lights sparkle from the town hall square. Weekend trips to Madrid, Barcelona, Mallorca, Alicante, et al. 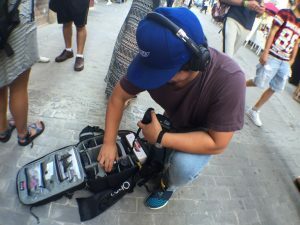 Matthew Gozzip grabs professional-grade photo equipment on assignment in the old city. Students will earn three credits of upper-division journalism electives for this course. The credits will be issued by the University of Jamestown, and we will work with you so they are easily transferable to your university. Students will stay with host families, close to the city center. 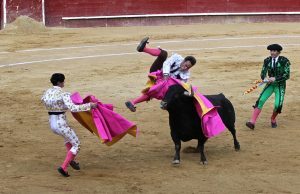 A bullfighter flies through the air after being caught by the horns. All language instruction and interpreters will be furnished by Euroace (European Association for Cultural Exchange). There will be one daily language session, Monday through Thursday (weekends are free for travel). John Shrader is assistant professor of journalism at the University of Nebraska-Lincoln. The coordinator of Nebraska’s new Sports Media and Communication major, he teaches sports and broadcasting courses, specializing in all aspects of sports media and broadcast presentation, reporting and writing. John spent 30 years as a broadcaster in San Francisco, where he won an Emmy Award as an on-air host in 2009. Jeffrey Brody is a professor of communications and member of the Asian-American Studies Program Council at California State University, Fullerton. He teaches advanced writing classes, courses on mass communication and society, and media and diversity. He has a distinguished record advising student publications. His international reporting class has taken journalism students on medical missions to Cambodia and Vietnam the past four years. His research interests include the Internet, ethnic press, newspaper industry and the Vietnamese American experience. Bruce Strong is as an associate professor and chairman of the Multimedia Photography & Design department at Syracuse University’s S.I. Newhouse School of Public Communications, where he teaches an array of video, audio, photography and multimedia courses. He has shot in nearly 60 countries and had images published in National Geographic and Time magazine. Amara Aguilar is an associate professor of professional practice in digital journalism at USC Annenberg. She previously was the journalism department chair and an assistant professor of journalism at Saddleback College in Mission Viejo, Calif., where she advised student news publications and led the journalism program’s mobile and tablet initiatives. She was honored by the California Journalism Education Coalition as “Journalism Educator of the Year” in the two-year college division in 2014. Claudia Strong has taught graphic design and media writing for 10 years at Syracuse University’s S.I. Newhouse School of Public Communications. Originally from Chile and fluent in Spanish, Claudia fell in love with graphic design after graduating from Northwestern University’s Medill School of Journalism. Determined to add to her writing and editing skills by exploring the world of visual communication, she worked at The Orange County (Calif.) Register, where she designed for all the paper’s news and features sections and earned honors from the Society for News Design and Lowell Thomas Travel Awards. Rachele Kanigel is a professor of journalism at San Francisco State University, where she advises Golden Gate Xpress, the student newspaper, and teaches reporting, magazine, international journalism and media entrepreneurship classes. She was reporter for 15 years for daily newspapers, including the Oakland Tribune and The News & Observer, and was a freelance correspondent for Time magazine. In 2017, she was named a Fulbright Specialist and she is available to work with international institutions on short-term projects of 2-6 weeks related to journalism, journalism education and media entrepreneurship. She has directed ieiMedia programs in Urbino, Perpignan and Jerusalem and is excited to help students explore Valencia. Jesús Ayala is a professor of broadcast journalism and multimedia at California State University, Fullerton. He teaches bilingual courses in the university’s Latino Communications Institute and oversees the school’s award-winning Spanish-language newscast, Al Dia. Ayala was an award-winning producer with more than 15 years of network-level experience covering breaking and long-format news stories. While at ABC News, he excelled as an expert covering breaking news in Latin America and South America. He reported on the devastating earthquake in Haiti, the pope’s visits to Cuba, civil disturbances in Venezuela and the rescue of 33 trapped miners in Chile. Clemente Lisi (multimedia faculty) is an affiliate assistant professor who teaches writing and journalism at The King's College in New York, and he advises the student online newspaper/print magazine/video platform. Lisi worked as a journalist for more than two decades, at the New York Post, the New York Daily News and ABCnews.com. He taught in ieiMedia's Bologna international journalism program in 2018. Katya Komarova (public relations faculty) is a visiting instructor at the Zimmerman School of Advertising and Mass Communications at the University of South Florida, where she teaches Advanced Public Relations, Public Relations Issues and Mass Media Research. Under Katya's supervision, USF students developed over 40 public relations campaigns for businesses and non-profit organizations in the Tampa Bay area, improving the community. Her specialty areas include public relations, media strategy and integrated marketing communications. Katya joined USF from consumer technology startup Houzz, where she built the company's presence in the Russian media. View complete faculty biographies on our Valencia Faculty Page. The cost is $4,995 plus airfare. Included: tuition – 3 credits, accommodations with a host family or in an apartment; travel insurance; farewell dinner; reporting on the city, paella cooking and the aquarium; a choice of optional activities and weekend trips, including easy access to Mediterranean Sea beaches. Graduates and students who do not need credit can deduct $450 from the program cost. Apply now to reserve your place in the Valencia, Spain, program. Or, contact Program Director John Shrader at: john.shrader@ieimedia.com. Students must fill out the online application and include contact information for two references using the “Apply Now” link. A $100 application fee is required with the application but will be applied in full to your program fees or refunded if you are not accepted into the program. Application deadline: March 1, 2019.